Every early summer the moms on my personal Facebook page make a comment about their apprehension over the store bought bug repellent, especially the ones that still include DEET. This is harmless for your pet. If you happen to spray down a counter top and find your cat rolling all over it then you’ll want to sanitize the counter again from the cat fur, but your pet will be fine. I find this funny because the first time I brought home cat nip my youngest child was very upset at the idea of giving her cat “drugs”, and I had to go out of my way to get her to wrap her head around the idea that getting the cat stoned on catnip was relatively harmless. Yes, Catnip Essential Oil is real, you can buy it online if you haven’t seen it in your local store. We’ve added a link for you to get access to it. One lady felt compelled to explain the catnip oil doesn’t exist and that she was an authority in the topic because she had been making organic body products for several decades. Well, Catnip Oil does exist, and people do use it for various recipes. You can even make your own if you want to put it in your back yard herb garden. It is a member of the mint family, and grows well enough just about anywhere any of your mint plants thrive. Originally, it came from Europe and Asia and was brought to North America buy the first settlers. Ever since then we’ve had an assortment of mint patches all over the place. If you can’t get your hands on catnip, you can substitute spearmint oil. Ants and bugs pretty much hate the mint plants. You can test this yourself by getting a robust cluster of any of the mint leaves. Break and twist the leaves so that the inner fragrance is exposed and set this in your windowsill, or any place where you see a little buggy foot traffic. You will quickly notice that ants will give the mint leaves a wide birth and walk around the leaves. Once you start leaving these sprigs in your drawers and under the cupboards you will notice the bugs will move out after a while. ONE: Carefully pour 3 oz. 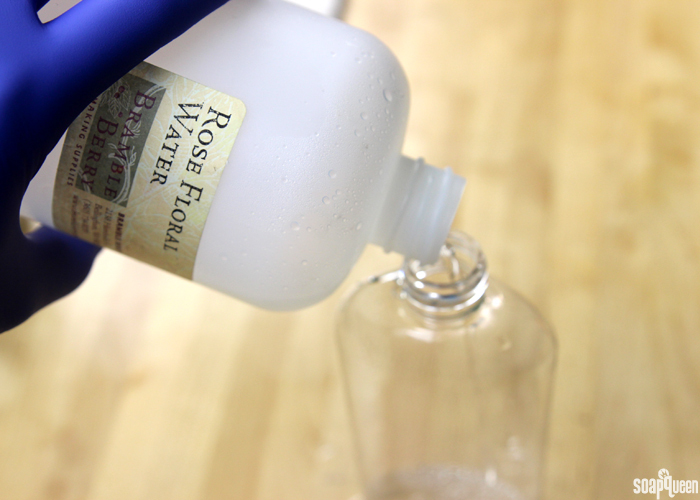 of witch hazel, water, or alcohol into a plastic bottle or your spritz bottle. If you’re worried about spilling, you can use a funnel. TWO: Drop each of your essential oils into your suspension liquid. THREE: Add 1/8 tsp. of Gold (light) Mica. What girl doesn’t love a bit of glisten. Seriously though, it’s helpful when you make a clear liquid product to give it a touch of color so you can recognize which bottle you want to grab. If you make more than one of these you can give them a touch of different color. Also, when others see this it will make them ask what’s in the bottle as compared to just assuming it is water and dumping it to use your spritz bottle. FOUR: Screw cap on tightly and shake the bottle to mix all the ingredients together and it’s ready to use! The ingredients may separate a bit, so make sure to shake well before each use. For more recipes like this one, come on over to the Thermal Mermaid Learning Library and join our group. You can these recipes ready to print and full video tutorials showing you how to make these products. We have dozens of soap making recipes for FREE at the Thermal Mermaid Learning Library. If you want to see the newest recipes that we're working on at Thermal Mermaid, then join our Facebook Group and you can interact with others who are trying these recipes outs and find out what others say.